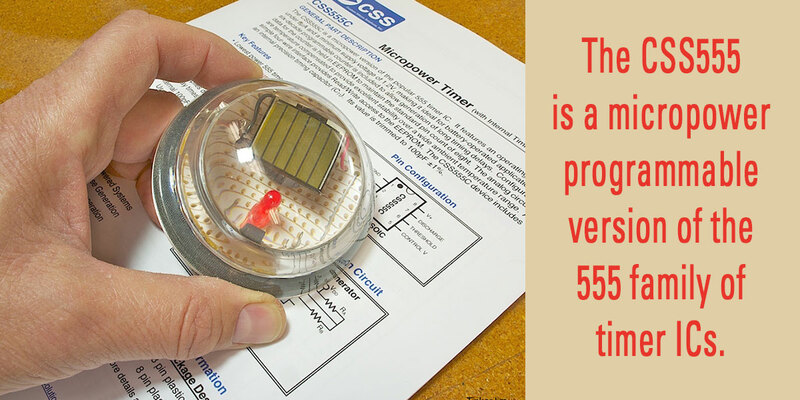 The CSS555 is a micropower programmable version of the 555 family of timer ICs. It operates at a current under 5 µA and a supply voltage from 5.5V down to 1.2V. These qualities make it particularly well-suited for long lasting battery and small solar powered projects. 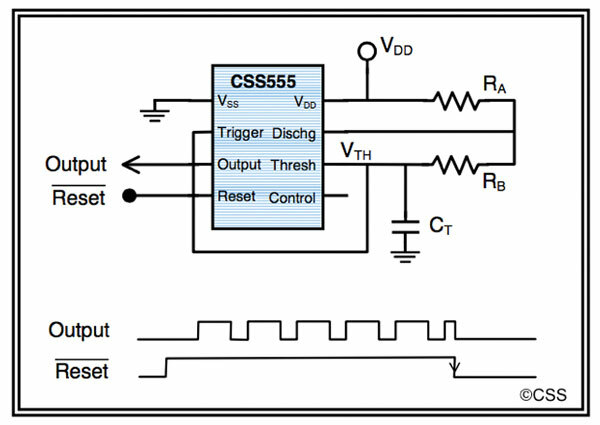 The CSS555 is pin-for-pin compatible with the customary 555 series timers as Figure 1 indicates. Therefore, application circuits have the familiar 555 topology as, for example, in the astable circuit illustrated in Figure 2. FIGURE 3. 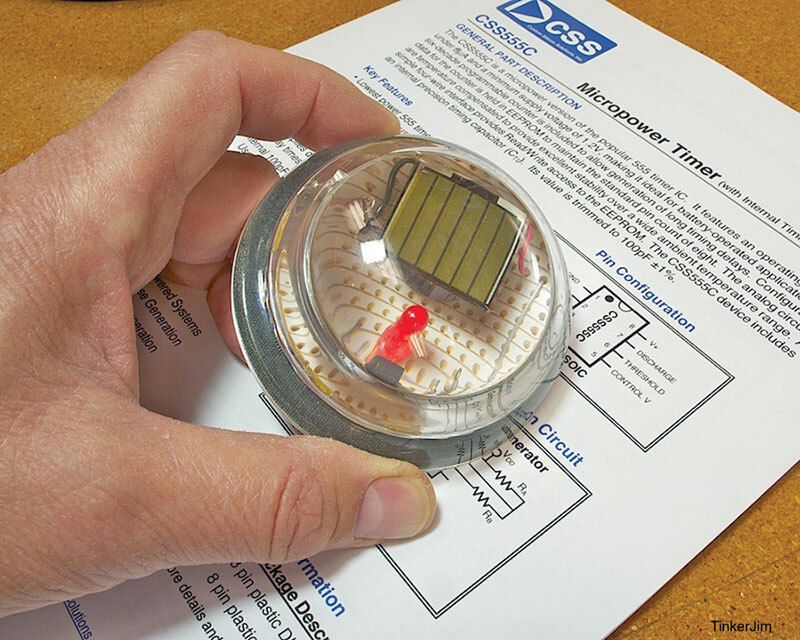 This electronic paperweight holds down papers by automatically utilizing the ambient gravity field. It also blinks. 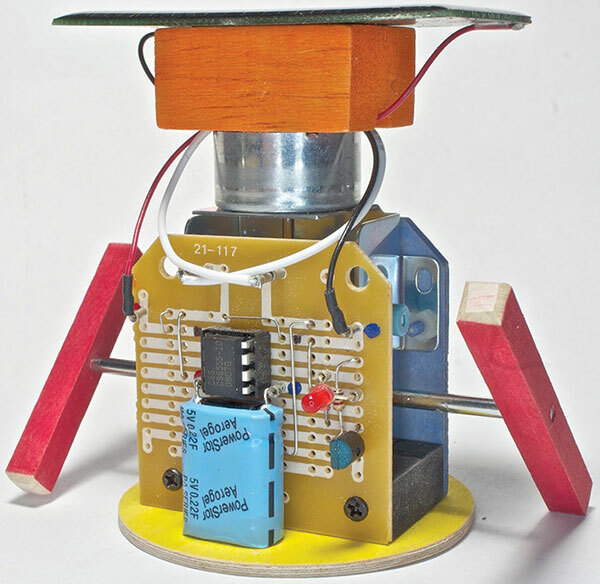 The little robot “Walker” in Figure 5 is equipped with this circuit, a good size solar cell atop his head, and, presently, a 0.22F capacitor. He periodically waddles around in a little circle (one of his arms/legs is longer than the other) whenever he has gleaned enough energy from the surrounding light. More information on all these projects can be found at Instructables.com. 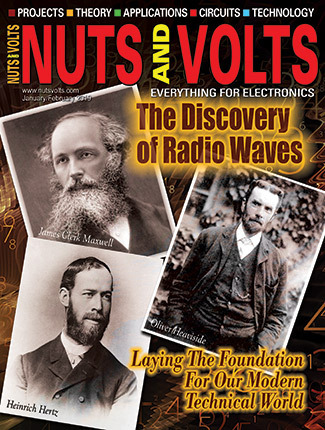 The ultra low power feature of the CSS555 truly excels in projects such as these. FIGURE 7. One-shot circuit using extended mode, giving an on time of 16.3 minutes. FIGURE 9. Screenshot of the computer-based CSS555 programmer. FIGURE 10. 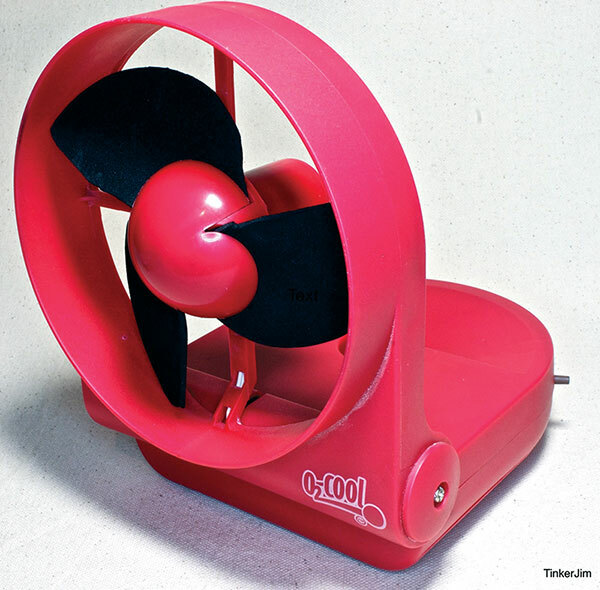 The “O2Cool” personal fan powered by two D cell batteries. 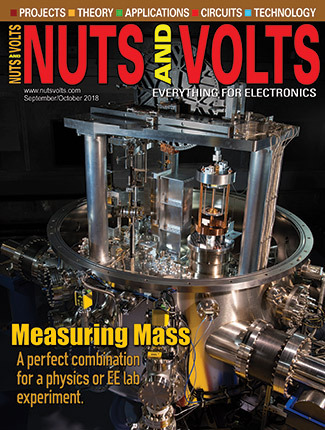 After a couple of summers of this, it finally dawned on me that the CSS555 in extended monostable mode offered a nice solution to this problem — and a significant savings in D cell batteries! It could be configured to run for around 15 minutes after just a touch of a button. During idle periods, it would consume a negligible level of power, taking less than a half dozen microamps between button pushes. 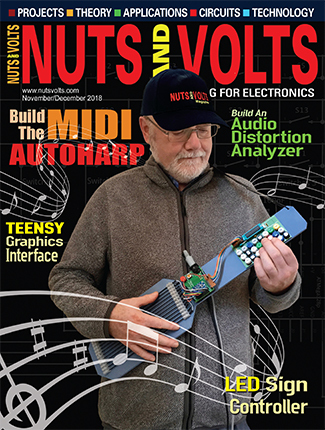 Of course, a microcontroller first came to mind but experience with this fan showed that it could provide adequate comfort when its series-connected pair of batteries wore down considerably below 1.5V. This was well below the brownout voltage for the micros on hand. 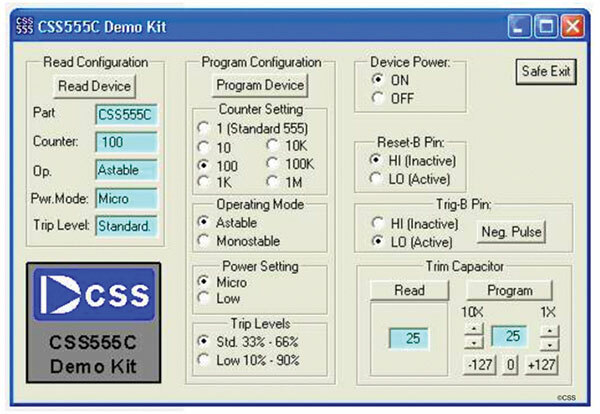 With the EZ Programmer, the CSS555 could be set for “low voltage” operation, which allows it to function from 1.2V. Figure 11 shows the schematic used for the fan circuit. With a counter setting of 104, RA = 3.3M = RB, and CT = 4.7 nF, this circuit gives a measured on time of some 17 minutes, which works out just fine. When the fan turns off (which in itself is very satisfying to one who has gone through so many D cells due to forgetfulness! ), if it starts feeling a bit warmish, just another touch of the button restores comfort. When leaving the scene when the fan is still going, it could be turned off via the built-in Off-Low-High slide switch. I usually just let it go, knowing that it will turn itself off in a few minutes and then be standing by ready to go with a tap on the button tomorrow or next week — or whenever it is needed — with its batteries in essentially the same condition. FIGURE 11. Schematic of the one-shot circuit used for controlling the fan motor. Note the bypass capacitor across the supply and ground; 0.1 µF suffices in such applications. A simple MOSFET to control the motor was ruled out since (as mentioned above) it was desired to have operation when the supply gets below 1.5V. 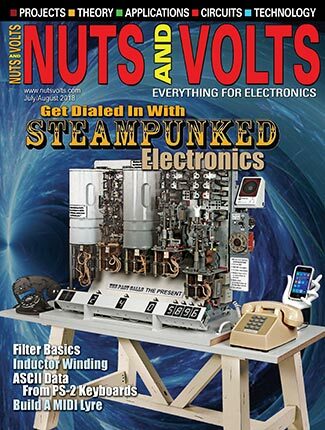 This would not have met the gate threshold voltage for the MOSFET on hand. However, I had several LCA717 OptMos chips in my parts box. The LCA717 is an excellent device for motor switching applications. 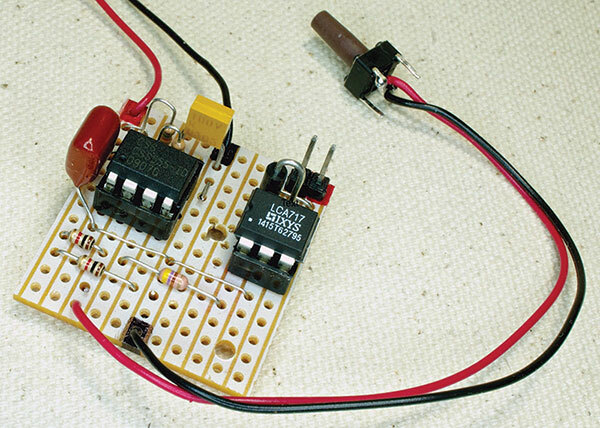 It requires only 1.2V forward to turn on the load, and has very low on resistance. 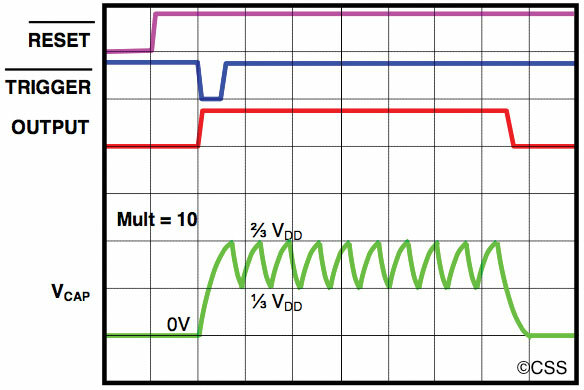 The LED within needs 2 mA which is negligible relative to the current draw of the motor, which in the fan ranges from about 180 mA on low to 350 mA on high (with new batteries). 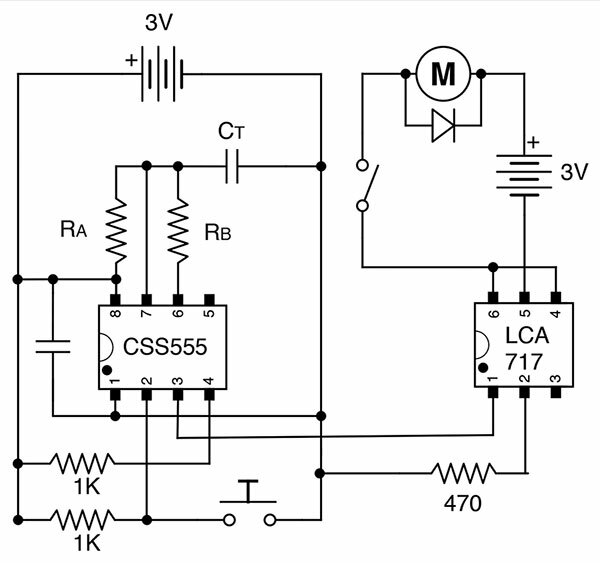 The LCA717 has the advantage (for some applications) of using a separate power source for the load, which is the way the circuit schematic here is shown. 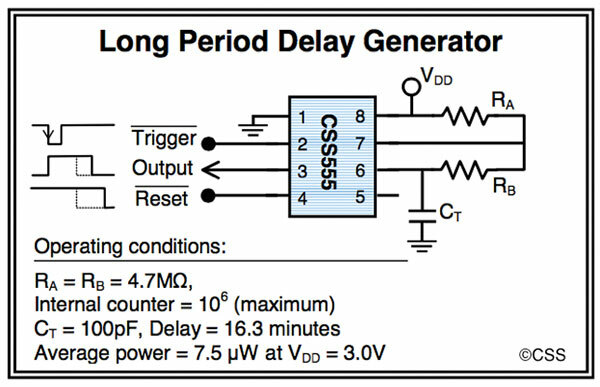 In this fan application, both the timer and the load share the same two series-connected D cell batteries. Figure 12 shows the completed circuit board, which was easy to fit in the cavity of the fan base. FIGURE 12. Circuit board of the now battery-saving fan.